API clients control site-specific behavior and data collection when users interact with the Registration UI or OAuth API endpoints through the flow configuration layer. Default Settings will be applied to all API clients unless overridden at the API client level. Settings can be managed through the Console or using the client and settings endpoints. Below is a list of settings available for use with the Registration experience. Additional settings may also be created for use within custom email templates; see Email Template Variables for more info. The name of the backplane bus. For Backplane versions 1. * only. The Backplane client password. For Backplane versions 1. * only. The Backplane server your application will be publishing to. For Backplane versions 1. * only. The Backplane client username. For Backplane versions 1. * only. The Backplane protocol version you should use. Values available are: v1.0, v1.1, v1.2. For Backplane versions 1. * only. The URL of the server hosting the Registration application. The Capture server is typically located in the janraincapture.com domain. Specifies the form used when editing a user profile in the Console. If the setting is not configured, Console will default to using the ccp_editProfileForm form, or if that does not exist then the editProfileForm form. To change the form used for editing user profiles, add the ccp_edit_form setting and set the value to the new form name. If you use an alternate form for editing user profiles in the Console, it’s recommended that you preface the form name with the string value ccp_ (e.g., ccp_custom_edit_form). If you click Resend Verification, you’ll send an email to the user asking him or her to verify their email address. If you click Send Password, you’ll email the user a link they can click if they need to reset their password. However, these options work only if you are using Akamai's native email service or an Akamai email connector to send transactional emails. If you are not using Akamai to send transactional emails, they won’t actually send email address verification or password reset emails. In that case, you might want to hide the two buttons by setting ccp_enable_email_send_buttons to false. To re-enable the buttons, either delete the ccp_enable_email_send_buttons setting or set its value to true. Specifies the flow locale used for Console actions such as creating and editing user profiles and sending emails. By default, the locale is set to US English (en-US). However, you can change the locale by adding the ccp_flow_locale setting and assigning it the appropriate IETF language tag. Note that the flow locale only affects certain actions within the Console: it does not localize or otherwise change the Console UI. Note, too that you will get unexpected results if you set ccp_flow_locale to a flow locale that does not exist. If you get unexpected results after changing the flow locale, delete the ccp_flow_locale setting. The Console will then use default flow locale. Specifies the name of the flow used for Console actions such as creating and editing user profiles and sending emails. By default, the flow name is set to standard. However, you can change the name by adding the ccp_flow_name setting and assigning it the flow name. Specifies the version number of the flow used for Console actions such as creating and editing user profiles and sending emails. By default, the flow version is set to HEAD, which indicates that Console uses the latest version of the flow. However, you can cause Console to use a specific version of the flow by adding the ccp_flow_version setting and assigning it the version number. You will get unexpected results if you set ccp_flow_version to a version number that does not exist. If you get unexpected results after changing the version number, delete the ccp_flow_version setting. The Console will the use the default HEAD flow version. Specifies the form used when sending password reset emails from the Console. If this setting is not configured, Console will default to using the ccp_forgotPasswordForm form, or if that does not exist then the forgotPasswordForm form. To change the form used for sending password reset emails, add the ccp_recover_password_form setting and set the value to the new form name. If you use an alternate form for sending password reset emails, it’s recommended that you preface the form name with the string value ccp_ (e.g., ccp_custom_password_form). Specifies the form used when creating user profiles in the Console. If the setting is not configured, Console will default to using the ccp_registrationForm form, or if that does not exist then the registrationForm form. 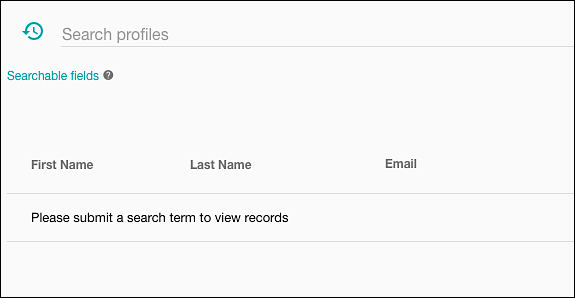 To change the form used for creating user profiles, add the ccp_registration_form setting and set the value to the new form name. If you use an alternate form for creating user profiles, it’s recommended that you preface the form name with the string value ccp_ (e.g., ccp_custom_registration_form). Specifies the form used when sending email verification emails from the Console. If this setting is not configured, Console will default to using the ccp_resendVerificationForm form, or if that does not exist then the resendVerificationForm form. To change the form sending verification emails, add the ccp_verify_email_form setting and set the value to the new form name. If you use an alternate form for sending verification emails, it’s recommended that you preface the form name with the string value ccp_ (e.g., ccp_custom_verify_email_form). The number of days that must elapse before deactivated accounts can be deleted by the system. If the delay period has not expired, a new user will not be able to register by using a unique identifier (such as displayName) that is currently assigned to the deactivated account. Instead, the new user is prompted to choose a different identifier. If the delay period has expired, the deactivated account is deleted and the new user can use their preferred identifier. Even if the delay period has expired, deactivated accounts are not automatically deleted. Instead, accounts remain in the system until a new user tries to register by using one of the account’s unique identifiers. If you set the delay to 0, deactivated accounts are deleted the first time a user tries to register using one of the unique identifiers. If you do not configure a value for deactivation_deletion_delay, deactivated accounts will never be automatically deleted. Instead, these accounts can be removed by using the Entity API and calling entity.delete. The fallback flow locale setting for Customer Care Portal if ccp_flow_locale is not set. The flow used in OAuth API endpoints if you do not set the flow parameter. This is also the fallback flow name setting for Customer Care Portal if ccp_flow_name is not set. The flow used in OAuth API endpoints if you do not set the flow_version parameter. This is also the fallback flow version setting for Customer Care Portal if ccp_flow_version is not set. Method for generating emails during the registration flow. If Akamai is managing your transactional emails this should always be set to ses_sync. If Akamai is not managing your emails this should always be set to firehose. See the Customizing Emails section for more information. This setting specifies the sender email address for transactional emails. If only an email address is included, for example, customer@example.com, the sender name will appear as “noreply”. A friendly sender name can be set for the email address using the format "Customer Name" <customer@example.com>. Please see Customizing Registration for more information on how to enable a new sender address with Akamai’s email service. This setting may only be set at the Default Settings level; it is not supported as a setting per API client. This is an entity-type specific setting. To view user information, you’ll need to create and run a search query. Note that this setting also prevents you from leaving the query field blank, clicking Search, and then returning all of your user profiles. To restore the default behavior (all your profiles are displayed any time you open the Manage Profiles page), set this value to true. The list of schema attributes that may be searched against when using the basic search functionality in the Console. For more information, see What You Can Search On. This setting may only be set at the Default Settings level; it is not supported as a setting per API client. This is an entity-type specific settings. The number of traditional login or password reset attempts a user can make in a given timespan (see login_attempts_threshold) before getting locked out. This feature is intended for preventing brute force login attacks, so the count includes both successful and failed login attempts. The time in seconds before a user’s number of attempts (see login_attempts) counter resets to 0. The counter starts at the beginning of the threshold time period based on a sliding window rather than the exact time of the user’s last attempt. When using the OAuth APIs, setting this to true will restrict the response on a successful login or registration to the attributes defined in the userData object in the flow specified in the call. The unique identifier of your Social Login application. This can be found in the settings page of your Social Login dashboard. The realm of your Social Login application if you are using a custom subdomain. This is the fully-qualified domain name aliased to an Akamai endpoint. See Customizing Your Application Domain for more information. If you are using a standard Identity Cloud domain, see rpx_realm. The API key (secret) of your Social Login application. This can be found on the Manage Application page in the Console. The server URL of the Social Login application. It should always be set to https://rpxnow.com. You can verify this by looking on the Manage Application page in the Console. Note. This setting may only be set at the Default Settings level; it is not supported as a setting per API client.